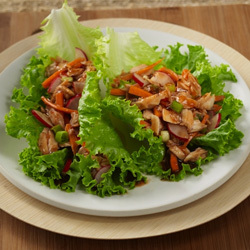 Mix tuna with all remaining ingredients, except lettuce, in medium bowl. Spoon 1/4 cup tuna mixture onto each lettuce leaf. Wrap leaf around filling to serve. For a little extra crunch, top each with a sprinkle of chopped peanuts. Look for matchstick-cut carrots in the produce section to save prep time. If radishes are not available, use 1/4 cup chopped drained sliced water chestnuts.